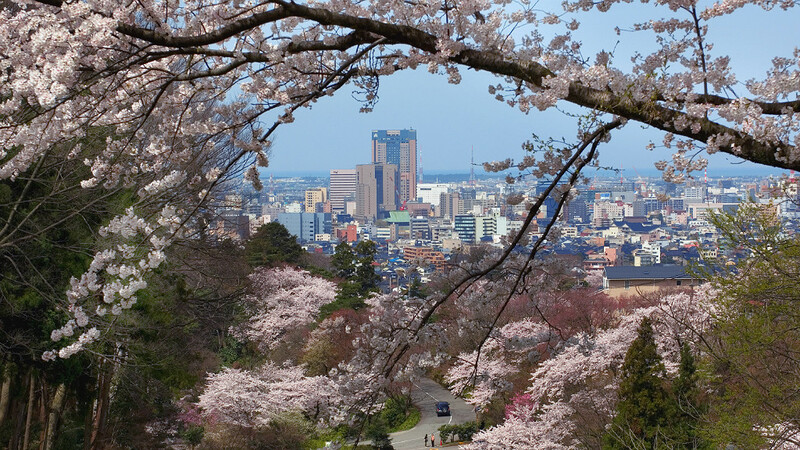 Known for its striking beauty that lasts only a couple of weeks, the sakura, or cherry blossom, is one of the most iconic images of Japan and a primary draw for springtime tourists. 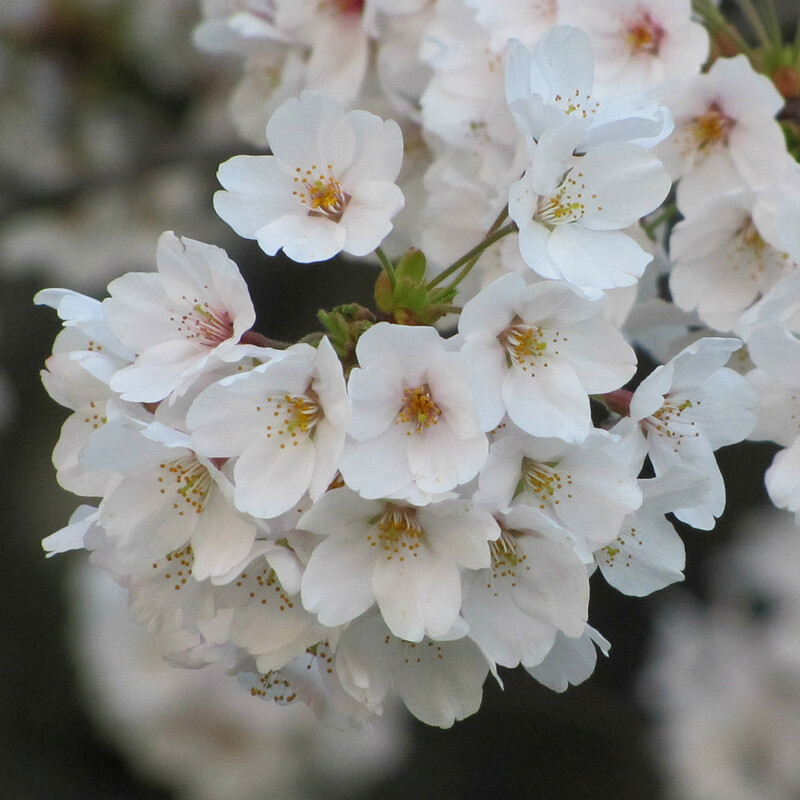 The short life of the cherry’s bloom is associated with the appreciation of fleeting things, and the visual bombast is the sign of new life and a new year for schools and businesses in Japan. If you’re lucky enough to be in Kanazawa for the sakura season, you’ll find these pretty pink petals throughout the city. Here are the top 4 areas for enjoying them as you move from one side of the city to the other in one day! 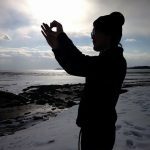 From Kaname Inn Tatemachi, pop down south only 350 meters, less than a 4-minute’s walk away, to the banks of the Saigawa, or Sai River. 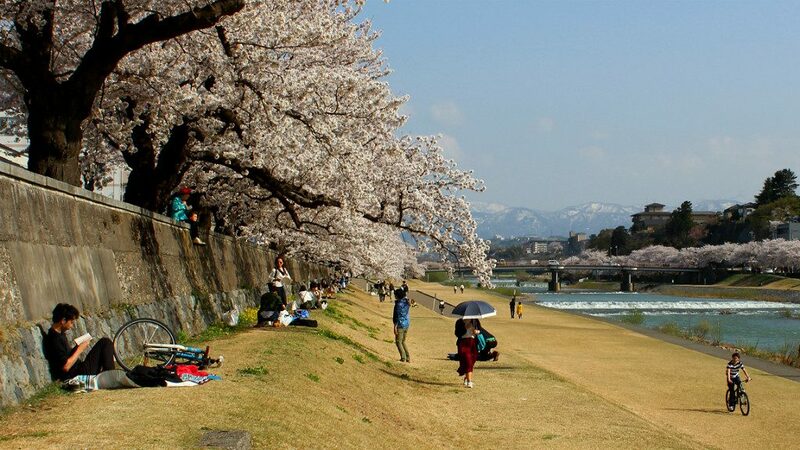 The wide banks are perfect for cherry blossom viewing with a backdrop of the nearby mountain range. Couples, families and school children occupy the abundant shade under overhanging sakura branches. 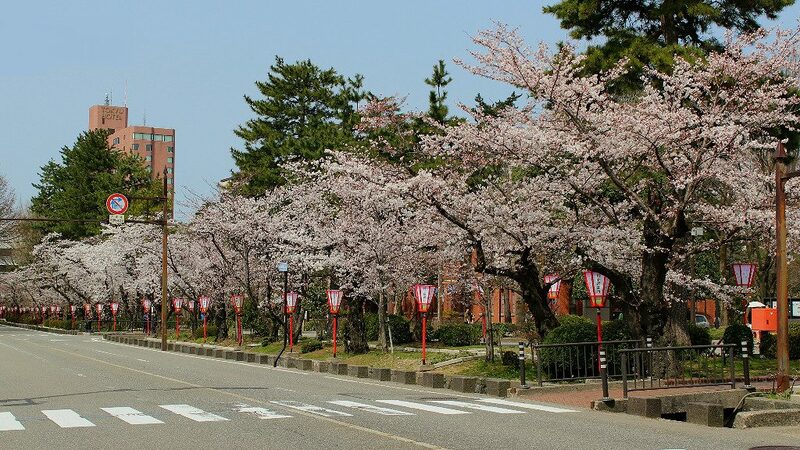 The cherry trees extend along the river south beyond the Sakura-bashi Bridge, between the charming Shin-Tatemachi neighborhood of mom-&-pop shops and Teramachi, the largest of Kanazawa’s three temple districts. These and most others are yoshino cherry trees. 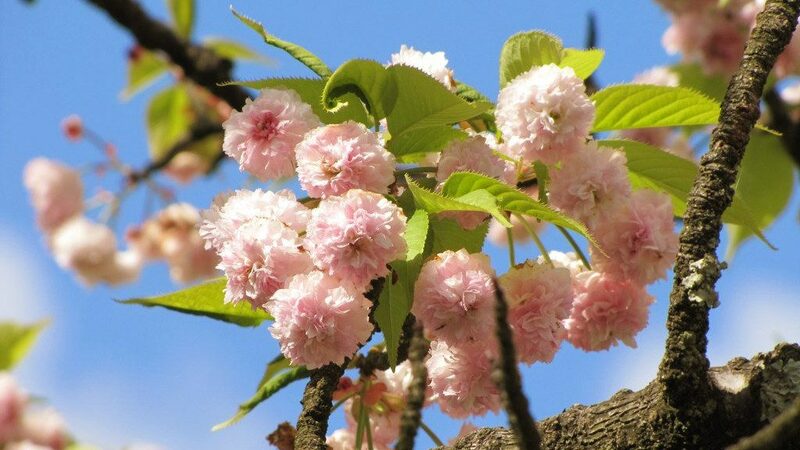 When most people think of a Japanese cherry tree, it’s the yoshino that comes to mind with its five pale-pink petals. 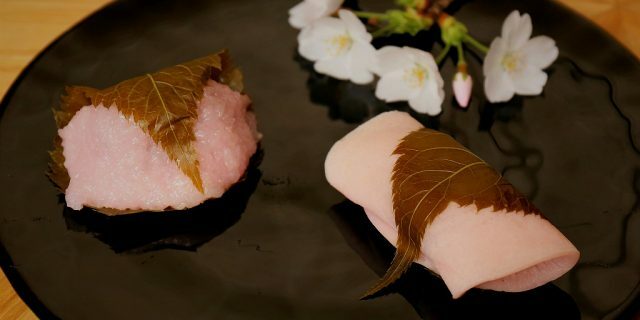 Most yoshino in Japan are grafts from the same source tree, guaranteeing that all yoshino cherries will bloom at the same time in a given temperature zone. 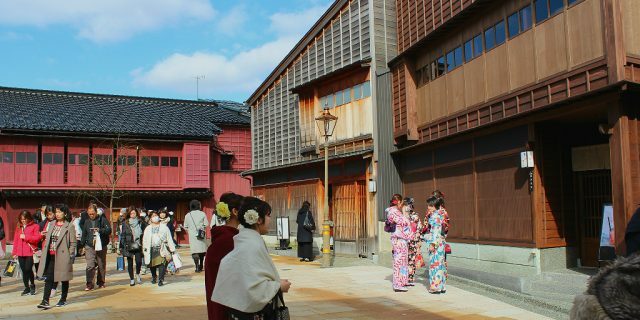 Start the day earlier in Nishi Chaya, the western-most of Kanazawa’s three geisha districts for some dark pink weeping cherries, and be sure to pop into the sweets shops for a treat and some matcha tea. Too late for yoshino sakura? See the Mountain Cherry! 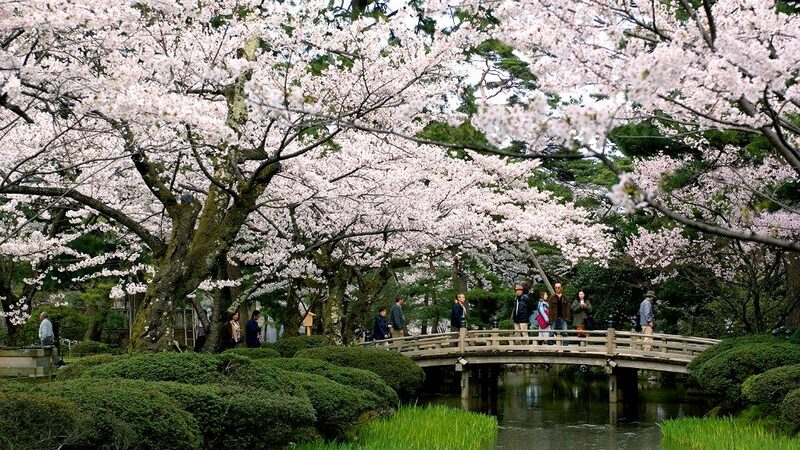 If you’re too late for the yoshino cherries along the riverside, take the W-slope up from the Sakura-bashi Bridge and go check out the 400-year old Great Sakura of Shogetsu-ji Temple in Teramachi. 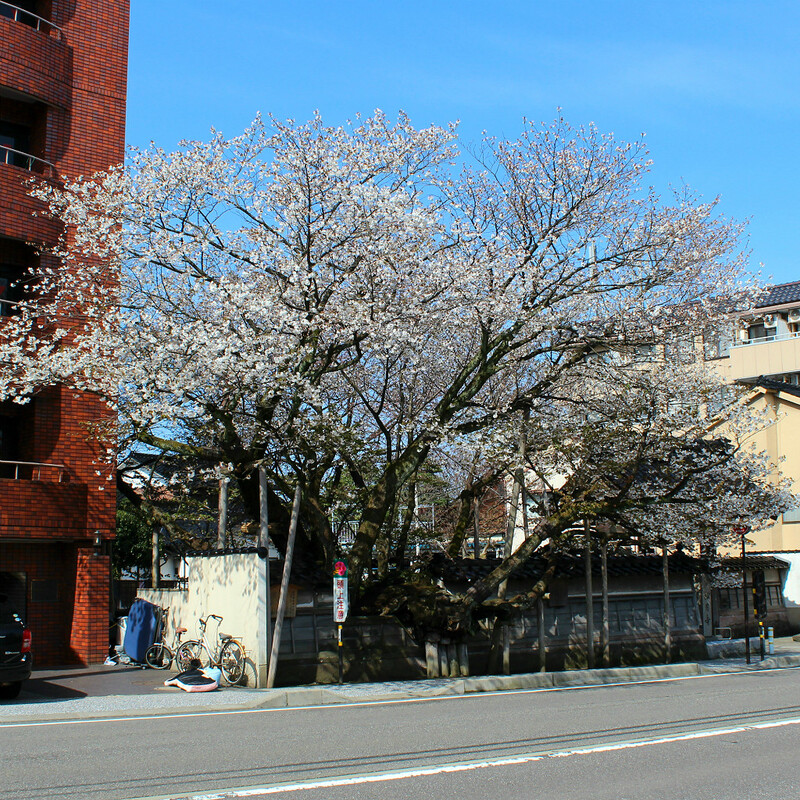 This massive specimen is a mountain cherry, a pure white variety of sakura that blooms a week after its pink cousins. 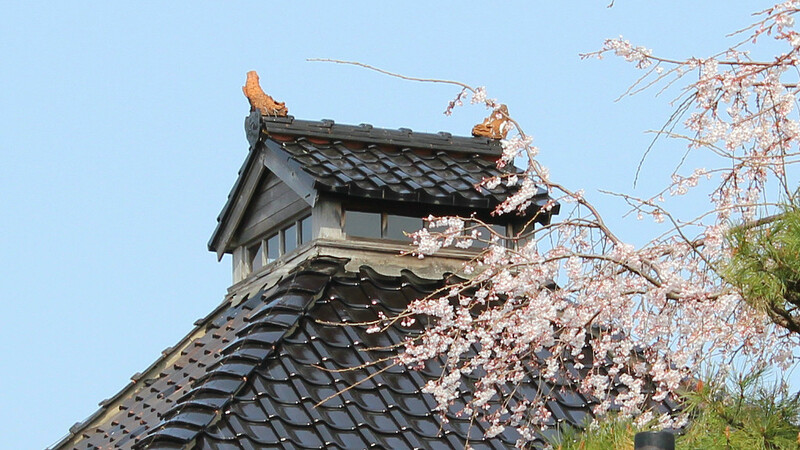 Head in the opposite direction, northeast of Kaname Inn for the next bundle of blossoms. 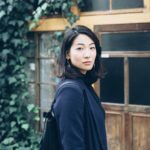 The neighborhood called Kaki-no-Ki-Batake—“Persimmon Grove” if you prefer a shorter description—is capped by a collection of cherry trees next to The 21st Century Museum of Contemporary Art, overhanging one of Kanzawa’s many castle moats. The neighborhood itself is an excellent spot for lunch. 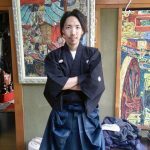 (I recommend the Kaga Hiru Gozen local cuisine set with tempura at Amatsubo; Hiroshi recommends a seafood lunch at Ageha, where they have some English assistance as well.) It’s also known for its enthusiastic participation in the summertime Mizukake Mikoshi Festival. 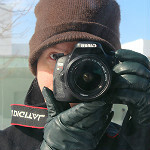 11:30 a.m. – 1:30 p.m. / 5:00 – 11:00 p.m.
11:30 a.m. – 3:00 p.m. / 6:00 – 10:00 p.m.
Across the way, the museum proper is peppered with several sakura varieties, and a line of yoshino cherries border the walkway on the south side. The museum is a great place for the kids, and the outside exhibitions and several inside areas are free. 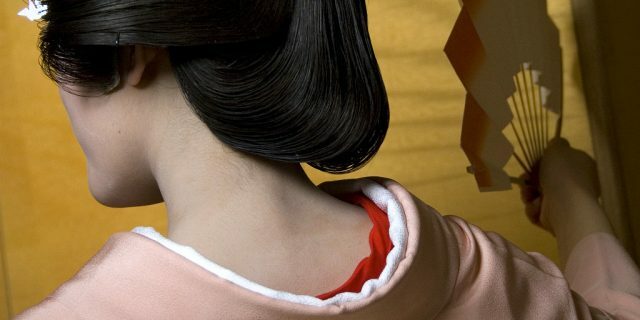 Head to the Noh Museum nearby to reach the next area, or pop in to try on a costume and mask. On the other side of the Noh Museum is the Hirosaka section Hyakumangoku-dori, or Hyakumangoku Road. Sakura trees line the median of this boulevard, raining petals down on local traffic and pedestrians. Enjoy the view on your way through the intersection while heading to the next and most popular areas: Kenroku-en Garden and Kanazawa Castle. 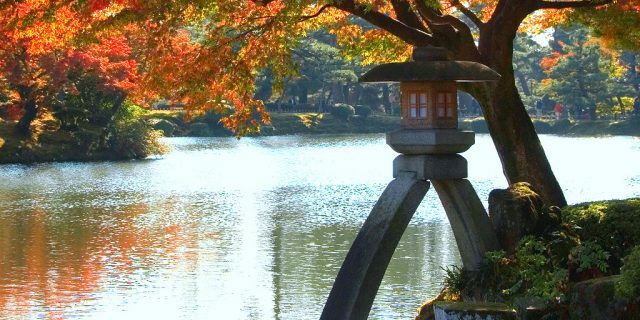 Whether walking on foot or taking the city’s many convenient buses, making your way to Kenroku-en Garden and Kanazawa Castle is itself a treat. Sakura trees line the roads on both sides, bordering the garden and castle park, creating a corridor of pale pink flowers. Inside Kenroku-en, don’t miss the photo opportunity at Hanami-bashi, literally meaning “Flower-Viewing Bridge.” Do expect crowds. (The earliest hours are the luckiest.) This delicate wooden bridge overlooking one of the garden’s many water ways is framed by yoshino cherries. 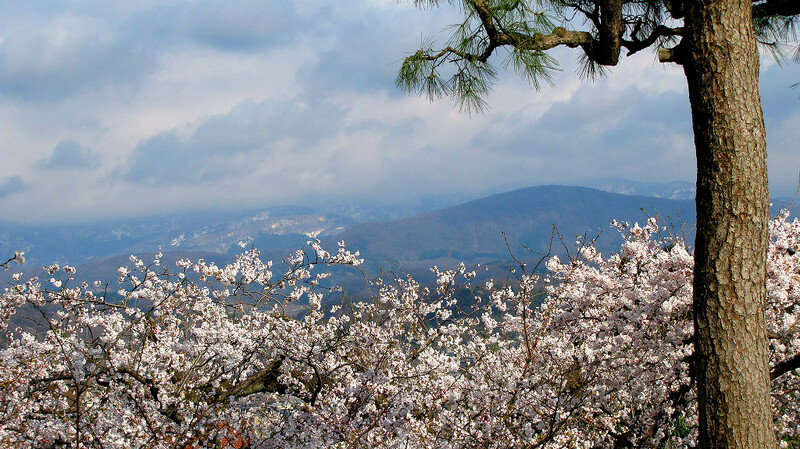 Along the garden’s north side is a panoramic view over cherry tree tops. 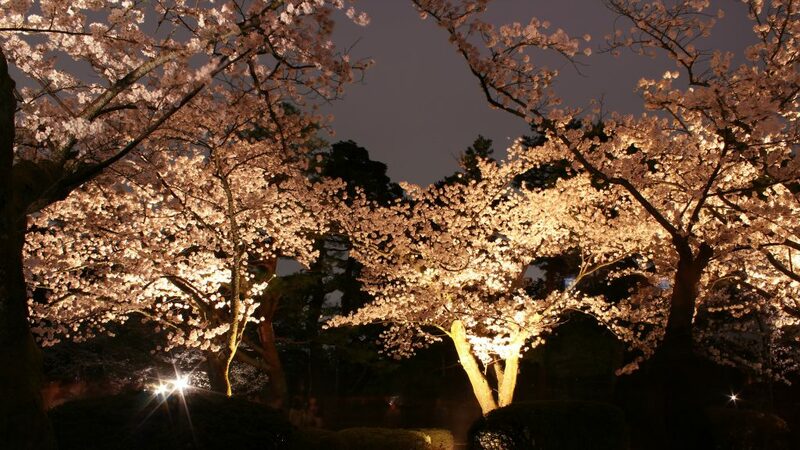 Come back at night during the garden’s light up event, when the garden is free, and the cherry trees are lit from beneath against the night sky. Yoshino abound along Kenroku-en’s series of shops and restaurants in “Little Edo” and the Katsura-zaka Slope. 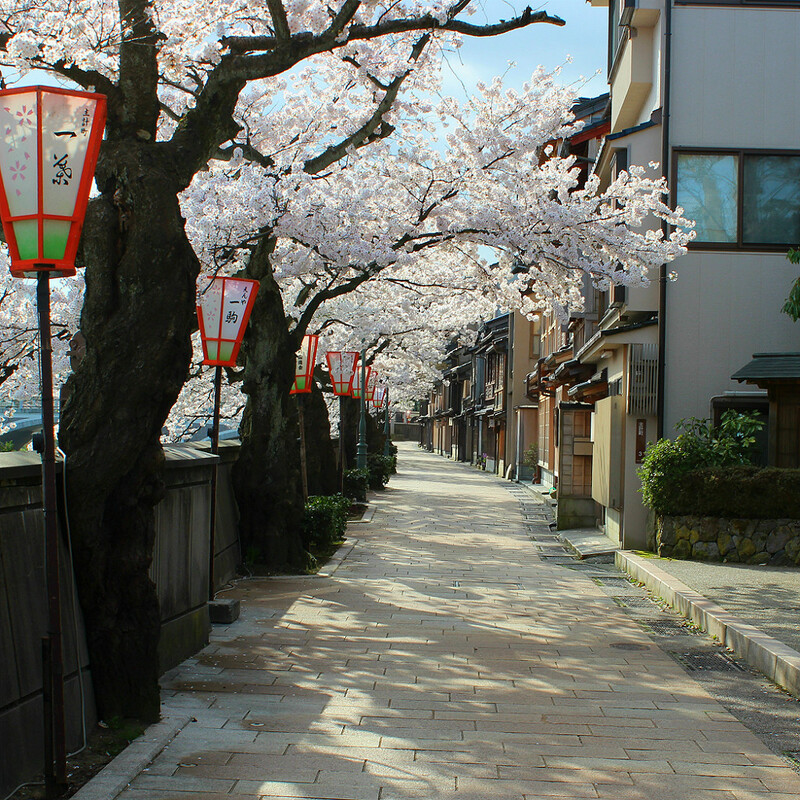 From the bridge connecting Kenroku-en to Kanazawa Castle Park, visitors can see sakura blossoms spilling over onto the road below. This area used to be the private homes of Princess Tamahime‘s entourage. The grounds of the castle park are abundant in sakura trees, but it’s the outer lawns and gardens that see the most hanami picnickers. 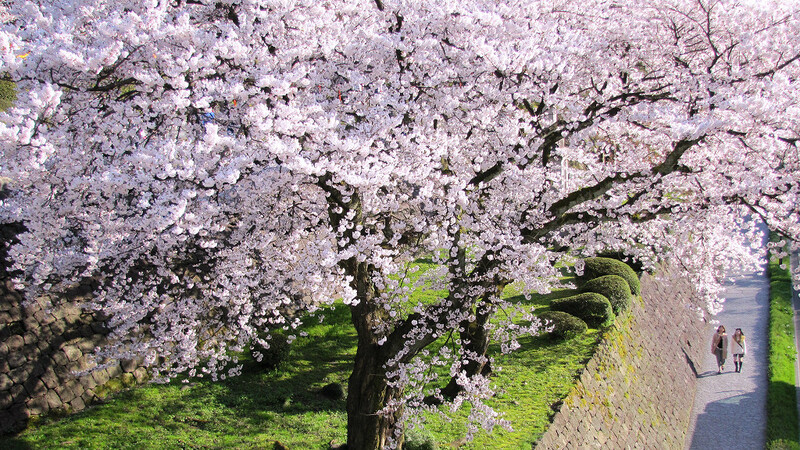 Along the grassy knolls near Kanazawa Central Park, along the castle’s south side, pale yoshino are more abundant. Larger groups of families and friends favor this area. 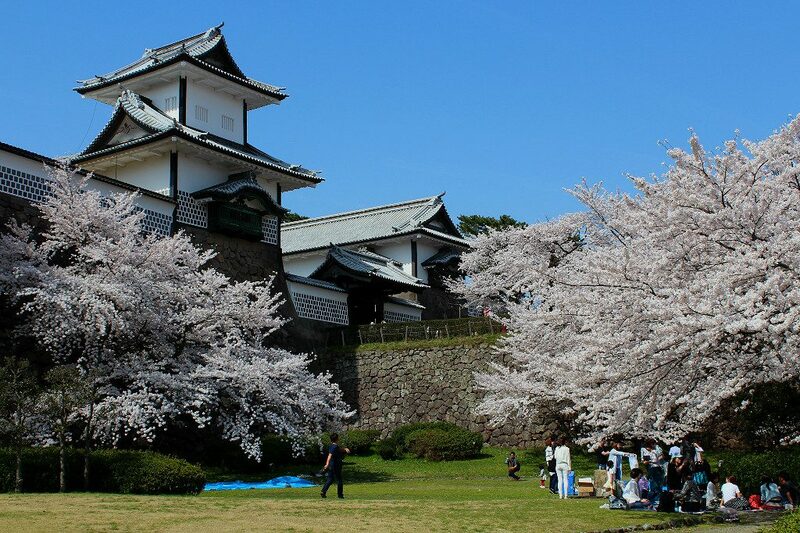 The castle’s east side has a variety of plants, including dark pink weeping sakura. 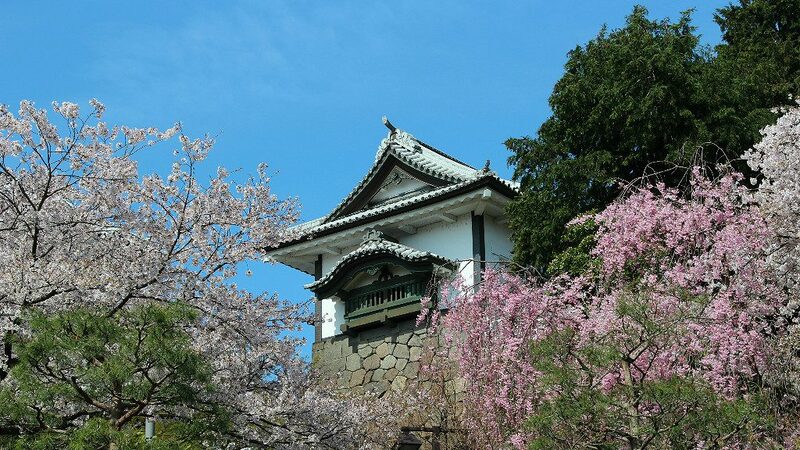 Pass through Hakuchoro, “White Bird Path,” the forested corridor along the northeast edge of the castle park, for a shaded sakura experience and to head to the next area. Too early? Enjoy the Plum Blossoms! The seasonal tradition of picnicking among the sakura trees called hanami actually started with the earlier-blooming plum blossoms. 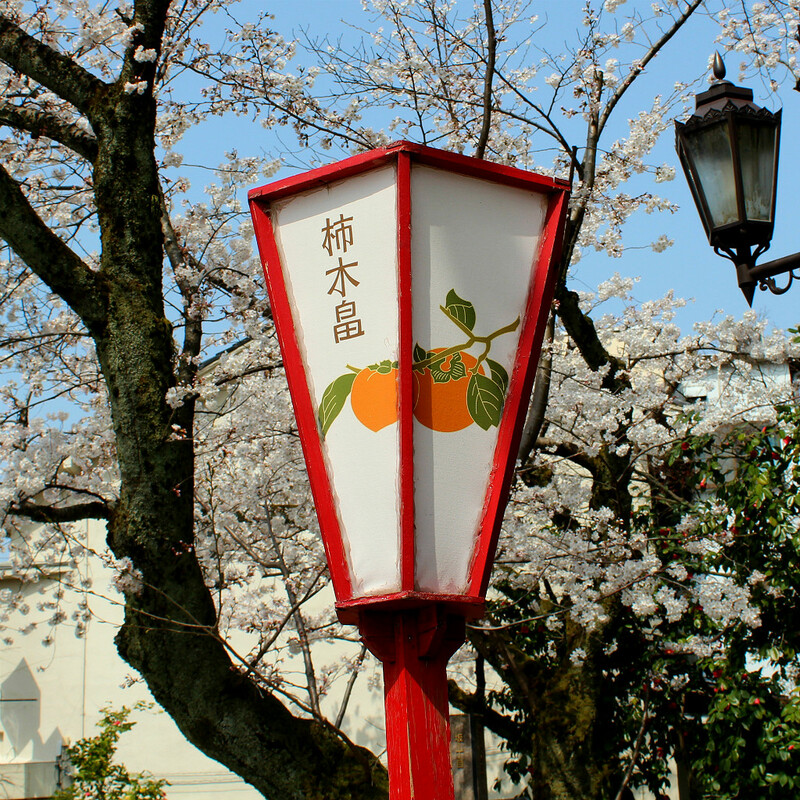 As with the sakura, plum trees come with a variety of flower shapes and colors. 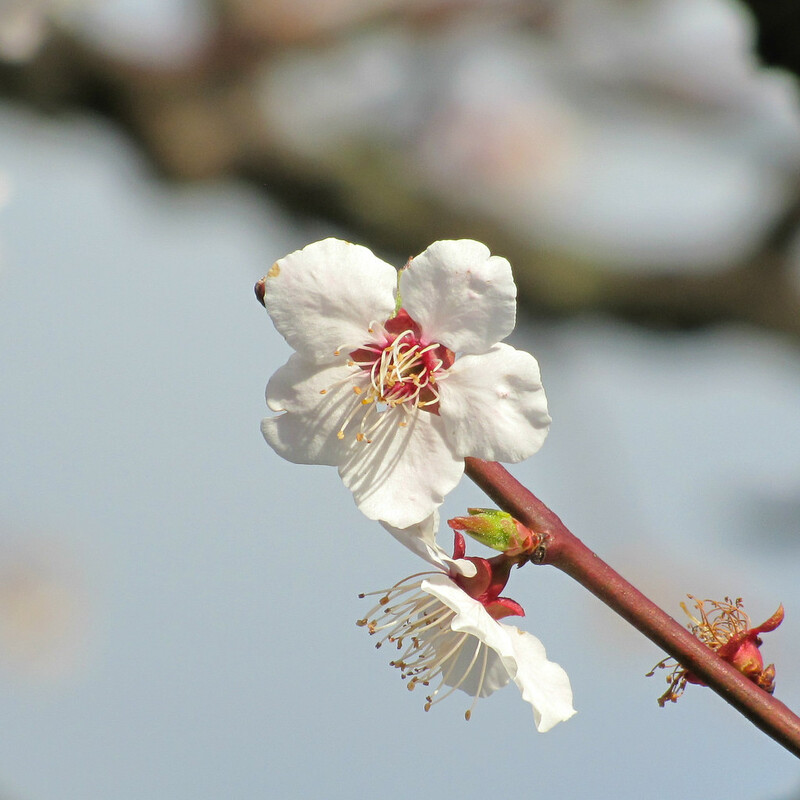 This five-petaled white plum is reflected in the symbol of the Maeda family, the daimyo who ruled Kanazawa for three centuries before the Meiji Restoration. 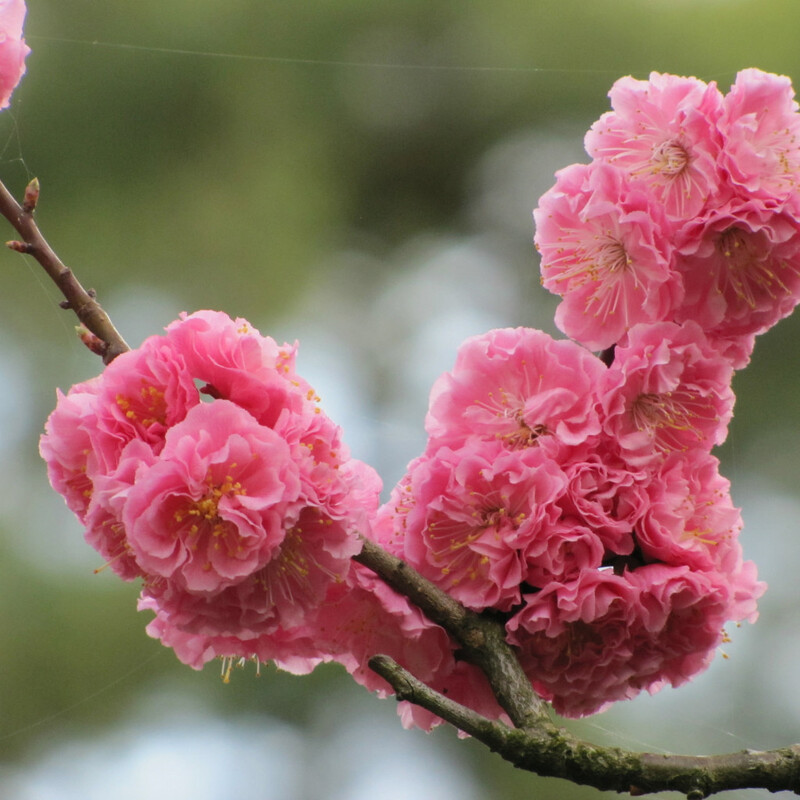 This lush, dark pink variety of plum dominates the Plum Grove within Kenroku-en Garden. Too late? Enjoy the Chrysanthemum Cherry! Later blooming yaezakura are a richer pink color. They’re striking for their lushness, with many more petals in a single flower. There are many subvarieties of yaezakura, including the kikuzakura, or Chrysanthemum Sakura, with 100 petals per flower. 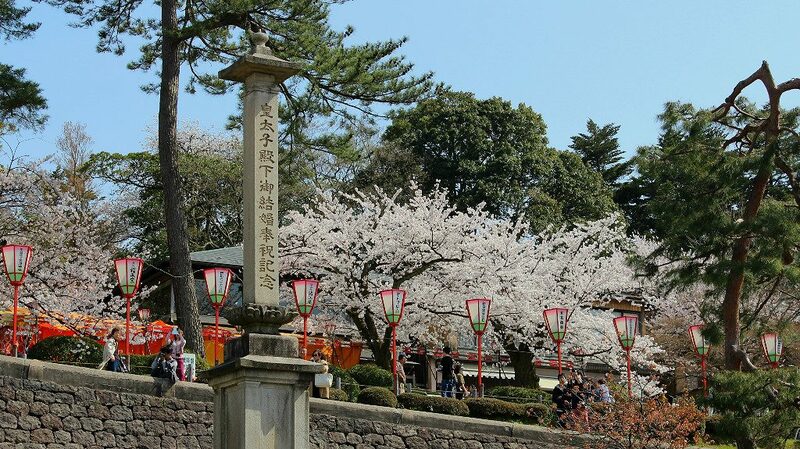 Kenroku-en features two large kikuzakura trees prominently as their pride and joy during the later cherry blossom season. 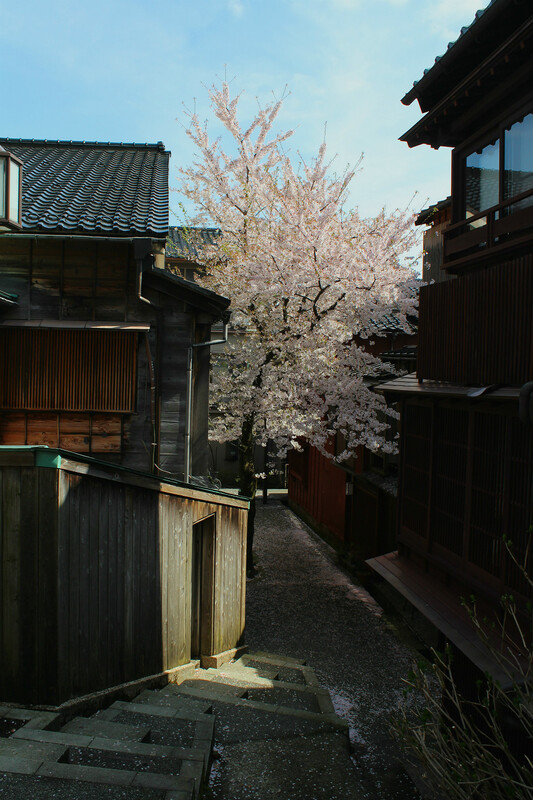 Kazue-machi, Kanazawa’s most secretive teahouse district, hides a small hidden stairway called Kuragari-zaka, which literally means “the dark slope.” Here, a single, towering cherry tree waits to greet all who arrive. At the base of the stairs is a small gallery honoring a late woodblock artist who resided in Kanazawa. 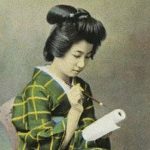 If you’re very lucky, you can hear geisha practicing their songs in the training center near the tree itself. 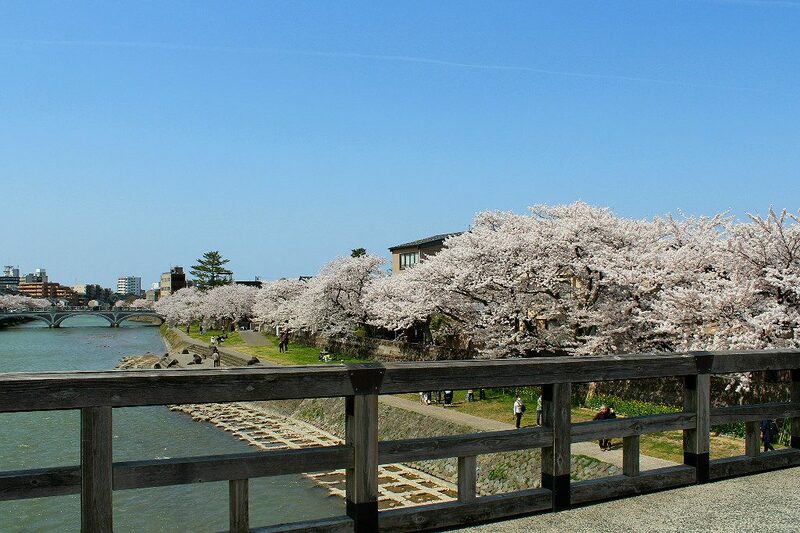 Kazue-machi has the best view of sakura overhanging the Asano River, the smaller of Kanazawa’s two rivers. 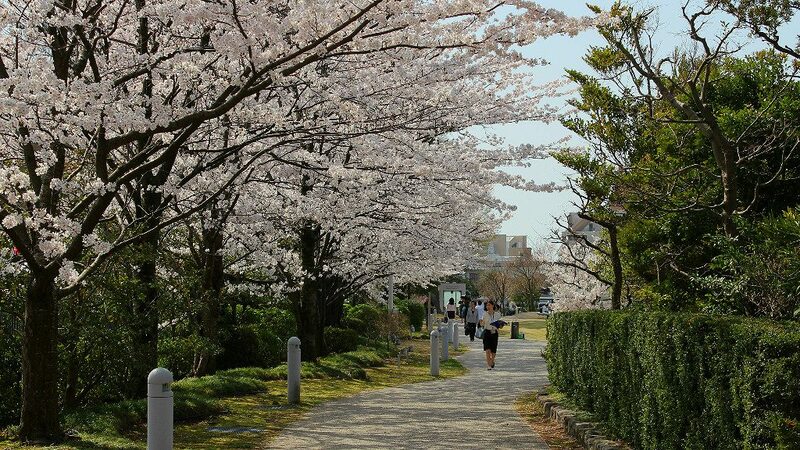 Along the riverside by traditional Japanese restaurants, a sakura canopy shades the promenade. 11:30 a.m. – 4:00 p.m. / 6:30 p.m. – 1:00 a.m.
12:00 – 4:00 p.m. / 7:00 – 11:00 p.m. Which area are you most looking forward to this spring? 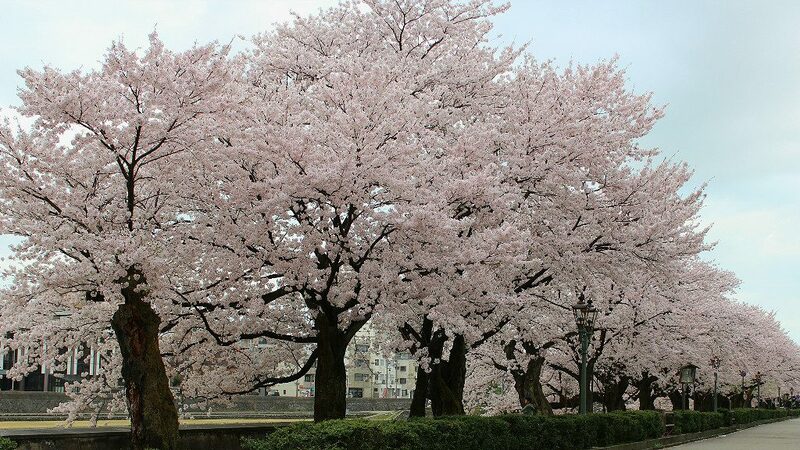 The current forecast for 2019 set Kanazawa’s yoshino sakura to flower April 1st, with best viewing between April 7th and 13th, peaking on the 8th. 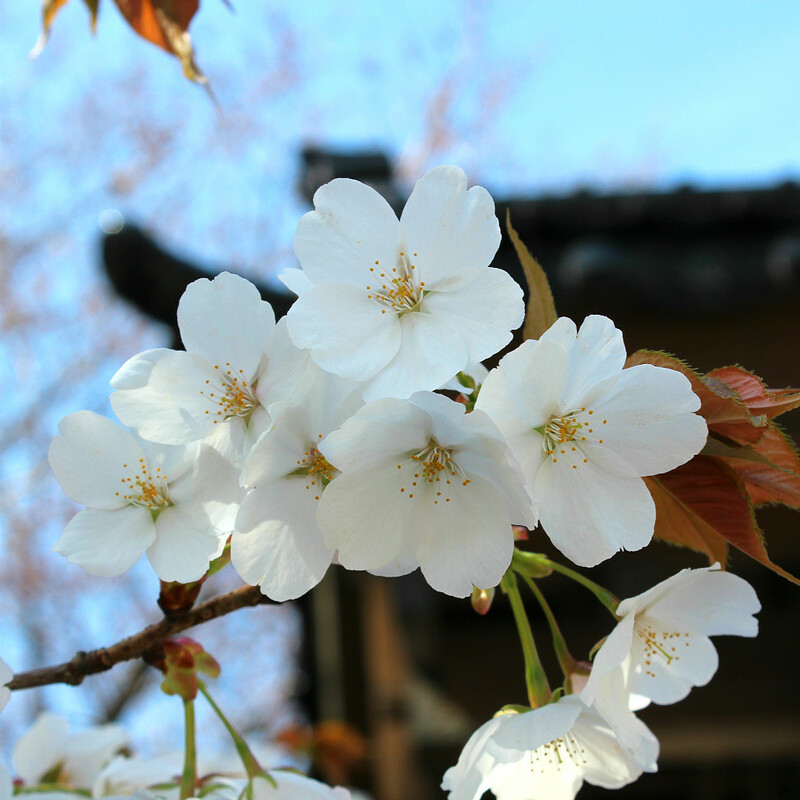 Please note that the forecast may change as sakura season approaches. 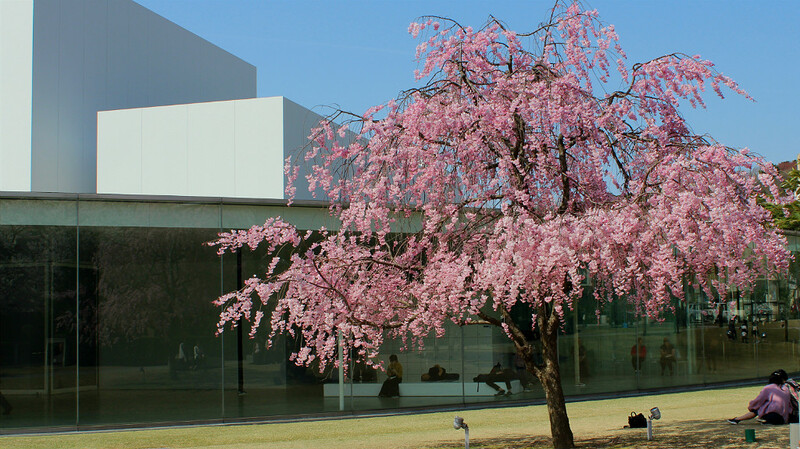 In 2018, Kanazawa’s yoshino sakura begin to flower March 29th, and reached full bloom April 3rd.